So this is a sort of an announcement: I was happy to receive my first copy of A Geology of Media during my visit to UNSW in Sydney. In other words, the book is now more or less out – a bit ahead of schedule and gradually available in online and offline bookshops, and of course in different e-formats (Kindle, epub, etc) already! The earlier published little e-booklet The Anthrobscene was a short preview single of this main book that is also now out! My talk in Sydney was the first “book talk” after the book is actually out, and it will be followed by several more during the Spring. The talks are primarily in Europe, and some launch celebrations are planned for May in Winchester (at WSA), and also London, Vienna, Utrecht and Stockholm. More details of dates and places to follow. Please find below the official release text with information on how to obtain a review copy! Please spread the word to people who might be interested and consider asking your university library to order a copy. Media history is millions, even billions, of years old. 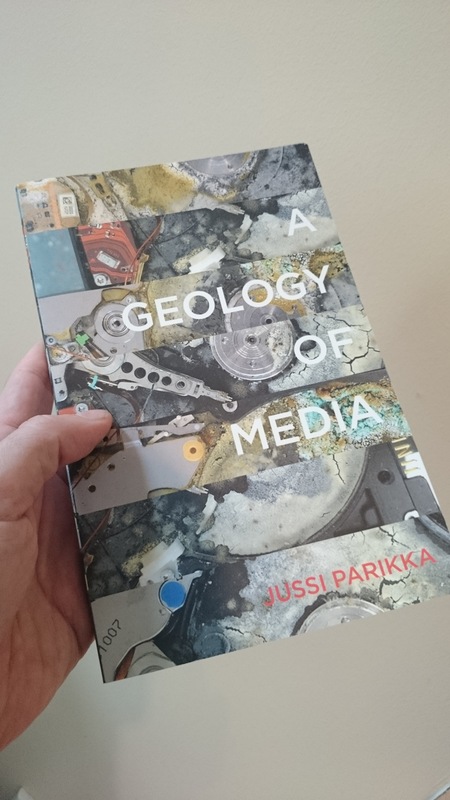 That is the premise of Jussi Parikka’s pioneering and provocative book, A Geology of Media, which argues that to adequately understand contemporary media culture we must set out from material realities that precede media themselves – Earth’s history, geological formations, minerals, and energy. Jussi Parikka is professor in technological culture and aesthetics at Winchester School of Art, University of Southampton. He is the author of Insect Media (Minnesota, 2010), Digital Contagions, and What is Media Archaeology?